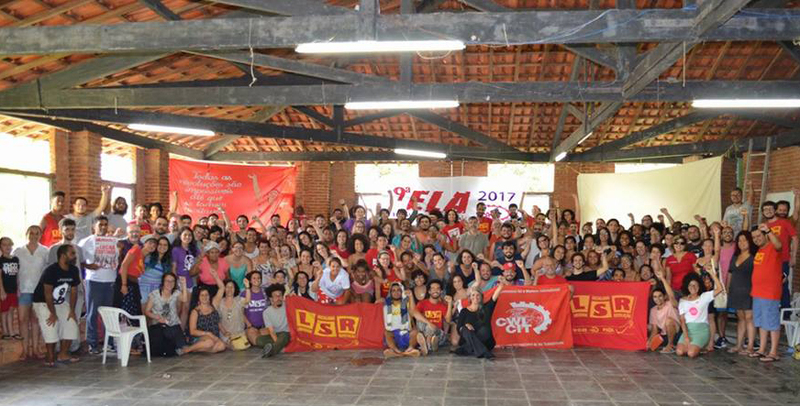 At the end of January, members of Socialist Alternative joined over 200 socialists from Brazil, Venezuela, Chile, Sweden and Spain for a week-long school dedicated to discussing the political situation in Latin America and the strategy needed to fight for a socialist Latin America, and a socialist world. The event was organized by the Committee for a Workers’ International (CWI) with which Socialist Alternative is in solidarity. The Brazilian section of the CWI, Liberty, Socialism and Revolution (LSR), hosted the school outside São Paulo. Many lessons can be drawn from the political movements developing in South America against austerity and state violence. The meeting grappled with how the right has been able to seize electoral advantage in many countries because of the failures of the left although there is very little popular support for neo-liberal policies. In Brazil, the “Workers” Party (PT) government of Dilma disappointed workers with deeper and deeper cuts to hard won social services. Widespread political corruption that came to light last year led to Dilma’s impeachment and the establishment of the incredibly unpopular right-wing Temer government, provoking renewed struggle. LSR has been active in organizing against cuts in education, including the occupation of a high school which lasted weeks. LSR is also working within the Party of Socialism and Liberation (PSOL), a left coalition which formed when the more radical elements of the PT broke away after the PT decided to implement initial cuts to retirement benefits while in power. The PT’s willingness to attack the working class and carry out the agenda of big business shows the need for a genuine party of and by the 99% that’s truly accountable to the social movements and working class people. PSOL has had uneven success, with some candidates in local elections able to gain many votes on the basis of a pro-worker program. In Chile, the small socialist forces of the CWI have had great success in the movement against the private system of pensions, which was established under the bloody Pinochet dictatorship. The CWI played a leading role in the coordinating committees and the July 24 marches in 2016 that saw one million people protesting in Chile. In Venezuela, the contradictions of a government that calls itself socialist, but never did away with the capitalist economy nor dealt effectively with the bureaucracy and corruption in the government, has left the majority of Venezuelans facing food scarcity, mass employment, and no safety. The right wing in Venezuela has used the economic crisis to make gains and attempt to reverse the positive gains made during the Bolivarian revolution. The CWI in Venezuela argues that the only way to beat back the right and solve the current crisis is to fully realize the Bolivarian revolution, to freeze the prices of goods and to take decisive measures against capitalism. The CWI Latin American School also served to go one step forward towards Izquierda Revolucionaria, present in Mexico, Venezuela, and Spain, unifying with the CWI. This fusion will lead to the strengthening of socialist forces everywhere, and deepen the political knowledge and experience of the CWI.